For my next computer upgrade, this spring, I also plan to replace my old SOLO. I'm basically choosing between the SOLO 2 and the TJ-08E. The SOLO 2 feels like a safe choise since it has everything I like with my curret SOLO + the extra features that are the reason to my case replacement (more grapichs card space and top intake for [semi]passive PSU). But at the same time, I would like to try something different and maybe smaller/lighter and also with better cable managment (i.e. TJ-08E). - Thin/weak case structure (whereas the SOLO is rock solid). How much of the problem is this? Are the side panels very wobbly and are there resonance problems etc? I plan to use an SSD + a single Ecogreen F4 drive. 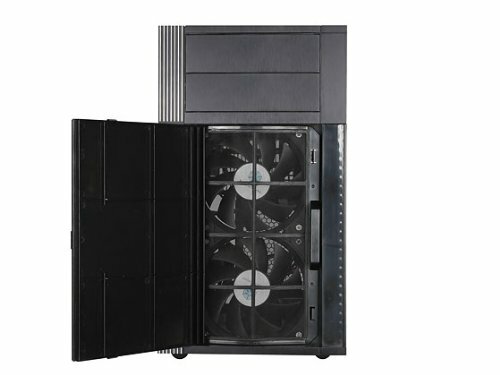 - The included 180mm fan. According to the SG-07 review this fan suffers from clicking bearings. Is this very noticable? An how are the general noise charateristics? With a SOLO 2 I would have a wide variety of 120mm fans to choose from, while I with a TJ-08E would be stuck with this 180mm fan. Any TJ-08E owners out there who could share their views of these issues? What is wrong with the SILVERSTONE SST-PS07B. It uses two 120mm fans? If they aren't quiet enough you can always replace them. Your solution. A cheaper Tj-08e and you can swap all fans for Nexus RS 120 mm. Also apply vinyl dampening to one or two side panels and you get great cable management as well as a quiet well cooled and modern case. I find the only thing that i dislike is the frontal fan on the TJ08-E, even at the low settings is very loud, i havent experience any clicking though, but at 900rpm is still very noisy at least to my standards, but at 600rpm starts to get tolerable, i stoped there as im using a high end gaming setup so i do stress it some, but still fine in temps at 600rpm, probably would be with less, but summer is coming so i dont want to draw them down to much atm. 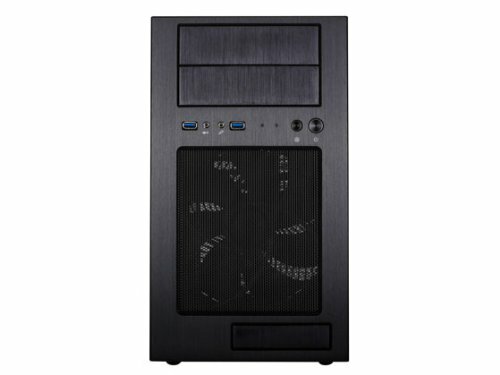 For the above and specially for the price the PS-07 is atm, Silverstone Tek Micro-ATX Mini-DTX, Mini-ITX Mini Tower Plastic with Aluminum Accent Computer Cases PS07B (Black) $79 free shipping that would be my choice for building on micro atx, i also built on the Solo II a htpc, and its fine case also, either should do great, but would prefer to have 120mm fan options as there are very little 180mm fans out there to replace or test, so recapping my suggestions, if you are building on micro atx i would go with PS07, if your buidling on standard atx then solo II would be my choice, for either choice, i would go with some Nexus Basic or Scythe Slipstreams 120mm fans. What basically is the difference between the SST-PS07B and the Tj-08e? Doesn't Boazar's proposed solution of using two Nexus fans address your issue? To what i remember the TJ08-E can mount a 180mm or 140mm not sure if you can mount 120mm, not to say 2x 120mm, again not sure but not likely. Very similar, little astetic changes like frontal grill vs side vents, among other things, but the chasis is very similar, the biggest difference is the frontal fan, 180mm vs 2x120mm. They both mounts two 120mm fans. So there really isn't much difference then, correct? Again im not sure the TJ08-E can mount 2x120mm on front, never seen one that has, i haven't disassemble my front to know if there is mounts for them, to what i remember reading when i was trying to figure what to do with the frontal fan is that you could replace it only with another 180mm or 140mm, but never read you could dual 120mm, this is from what i remember, if you have a photo or a link that has dual 120mm, ill be interested on seeing it. My guess is you cant, the PS07 has the USB connectors and power/reset switches on the side, this is what imo allows the twin 120mm, check the pics below for you to see what i mean. What is wrong with the SILVERSTONE SST-PS07B. I was also thinking about mounting 4*92mm (Nexus 92) fans in the front. I know it's not built for that, but with some cable ties it should be possible. But 4*92 may however not be optimal from a noise perspective. Getting some sort of automatic fan control could help keep the front fan quiet, at least when the pc is idle. Ideally, the front fan would be controlled according to both cpu and gpu temps. You could do this in speedfan if you have a spare, controllable header on your motherboard. There is a pwm to voltage control converter that you could use if you want to keep the stock fan, otherwise you could switch to a 120/140 mm pwm fan. I own the TJ-08E as well and I'd like to echo Abula's statement that the front 180mm fan is too loud for me, even on the low setting. Adding a 7v resistor helped a bit, but it's still not as quiet as my P180 machine as I need to have the fan set to "high" to get enough voltage to spin up! The resistor + low setting is quiet enough, but there's the spin up problem. And yes, the walls, top, bottom, and just about every surface is noticeably thinner than Antec's cases. When empty the case feels a bit flimsy, but once all the components are installed the case is structurally firm enough for me. You'll still have to be extra careful about vibrations since having thinner material means vibration noise is a bigger problem. Just something to be aware of if you're used to your cases being built like a tank. I still highly recommend this case though, since I think its internal design is one of the best. Making it completely silent will take more work than an Antec case. This is the same form factor as the stock fan, but reportedly almost silent. There are a few others out there if you look. See this posting and related replies in the thread for more info on the above. You'll have to work a bit on the retrofit but if you're doing it during initial setup it doesn't seem too bad. I've fitted a Phobya G-silent 180 mm fan in my case (Fractal Design Arc Midi), along with 4 Thermalright X-silent 140 mm. I run the Phobya fan at full speed and the Thermalright ones at 750 RPM, the Phobya noise is drowned by the Thermalright so it is fairly quiet. However the few reviews I've seen point to much lower CFM than advertised, which may be an issueif it is the only fan in the case? I have 1xScythe [email protected] on my Noctua NH-U12 for my i5-2500K. 1xScythe GT [email protected] on my Arctic S1 for my HD6950. 1x180 AP @ 300rpm. First off the 180mm isnt very effective because it has bad noise signature even on 300-400rpm. Problem with the AP is that at higher RPM the bad noise signature will be because of 3 stuff. 1 is the bad motor, it is ticking for some people (me included). 2 is the airflow sound at higher rpm, this is obviously eliminated when rpm i lowered to about 400-600rpm. 3 is what i believe to be the pushing of air throu the AP grill which can only be resolved by lowering rpm further to 300-500rpm. So 2/3 issues can be resolved by lowering the rpm but the grill on the AP that directs the airflow is unncessery and i even believe it to be harmful too cooling capacity in such a small case. I believe the AP grill is probably a good idea for cases like the FT02 but not the TJ08-E.
My system is running very toasty because the 180mm isnt pushing enough air into the case at 300rpm, i believe at 700rpm it would have been enough for the components. Currently my i5 is at 40-50c idle and 60-65c gaming Fifa 12. And my HD6950 with S1 and [email protected] is at 46c idle and 65c gamin Fifa 12. Not crazy hot but its not an effective cooling at the noiselevels. I will report back once i get my Phobya 180mm fan too see if i can improve my temps with less noise. I also fitted the Phobya in my TJ08-E. You might be right about the airflow, but my system is quieter and cooler with the Phobya at 700rpm than the AP @400-500rpm. Do you regret the change of 180m fan?